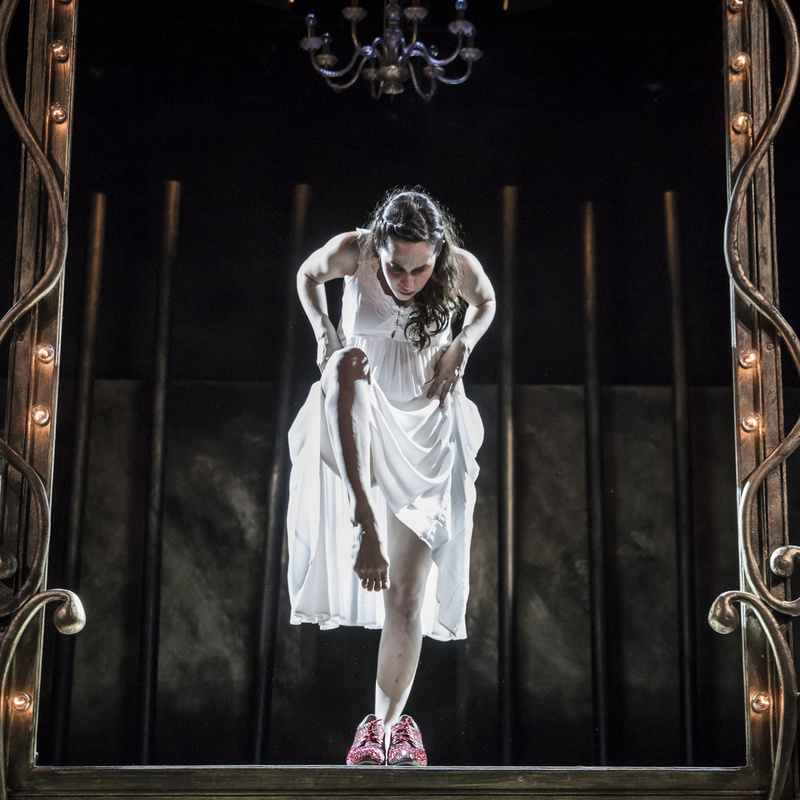 The Red Shoes – Gate Theatre – Review by Frank L.
Until 27th January, 2018 – Photo Credit: Ste Murray. We realise that this is not a conventional Christmas story right from the off. The play starts with a funeral! Karen (Stephanie Dufresne) is left an orphan after the death of her mother. She is taken in by the local priest (David Pearse) who finds her “a good home” with a rich couple. They are Bob (Owen Roe) and Mariella (Marion O’Dwyer) Nugent. He is a distant cousin of the deceased and works as a developer while she is a socialite. Mariella is seeking to engineer herself onto the board of a charity which works with orphans and she hopes this act of generosity will be sufficient to sway those whom she needs to influence. She invites the members of the board to a dinner party in her home, where she will introduce the orphan. Karen needs a decent pair of shoes for the event. Mariella despatches Karen along with her old housekeeper Mags (Rosaleen Linehan) to a famous shoemaker (also David Pearse) to get a pair of plain, respectable shoes. However, all does not go to according to plan. The Red Shoes is one of the less famous stories by Hans Christian Andersen. This is a new version by Nancy Harris who moves the setting to modern-day Ireland and alters many of the details from the original tale. The religious elements of the story have been replaced by the greed and so-called glamour of our contemporary society. She also draws on a variety of other fairy tales with hints of Cinderella, Snow White and other stories present. The Nugents have a splendidly ghoulish son Clive (Robbie O’Connor) who creates works of art. His area of artistic obsession is taxidermy and even the neighbour’s cat is not immune. The above cast members all carry out a myriad of minor roles along with Paul Mescal, Muirne Bloomer, Muiris Crowley and Raymond Scannell which makes for a large ensemble. 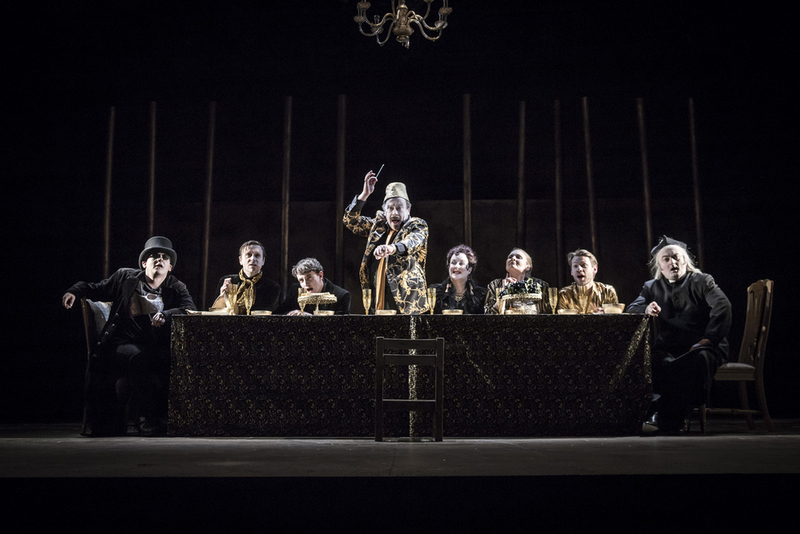 The members of the ensemble move about the stage at times in an impressive series of set pieces including dance routines at the ball. Stephanie Dufresne has a number of solo dance sequences which are carried out with great skill and dexterity. What is most striking about the production is the work of set and costume designer Monica Frawley. The set design is stark with simple backdrops moved manually by various members of the ensemble to create the locations required. But the alternating scenes evolve so stylishly that it is a joy to behold. The costumes are lavish especially for the major social events, showing the vulgarity of social-climbing Mariella and her cohorts. There are also a succession of marvellous visual gags which create a great deal of merriment. There is a sense of the macabre throughout with hints of Tim Burton’s visual style. In her notes, writer Nancy Harris states “Fairy tales are often more brutal than we remember”. 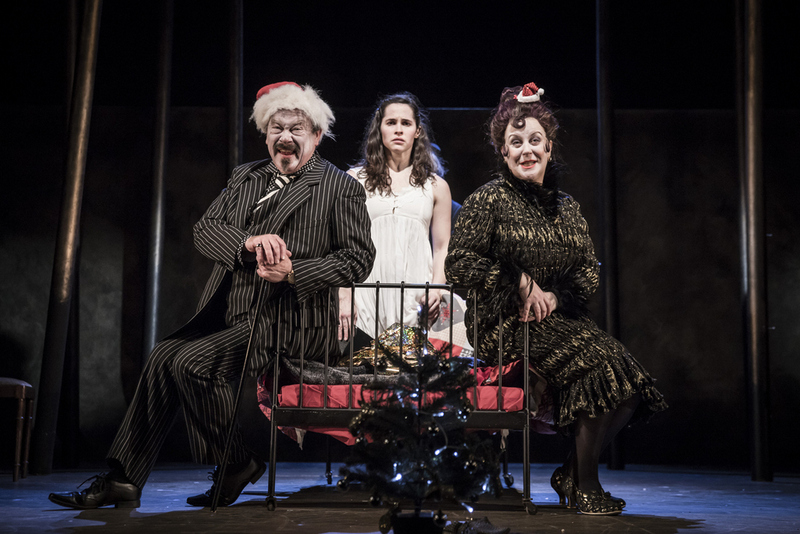 While this is very much a Christmas show it is also quite sinister. Director Selina Cartmell has created something enjoyable but also quite unnerving. The early scenes (including the funeral) are light and insubstantial but after the interval the darker elements are revealed. The core of the ending remains from the original work. While there are many moments of humour you leave the theatre perturbed by its dark imagery. The Red Shoes has an unusual and mischievous heart, richly packaged in an elegant parcel.